If you haven’t yet discovered the Atlas Obscura site, check it out. The writers over there cover all sorts of little known places, people, and things, and the newsletter almost always offers articles that I want to read. Today they posted about the history of carpets, which goes back thousands of years. 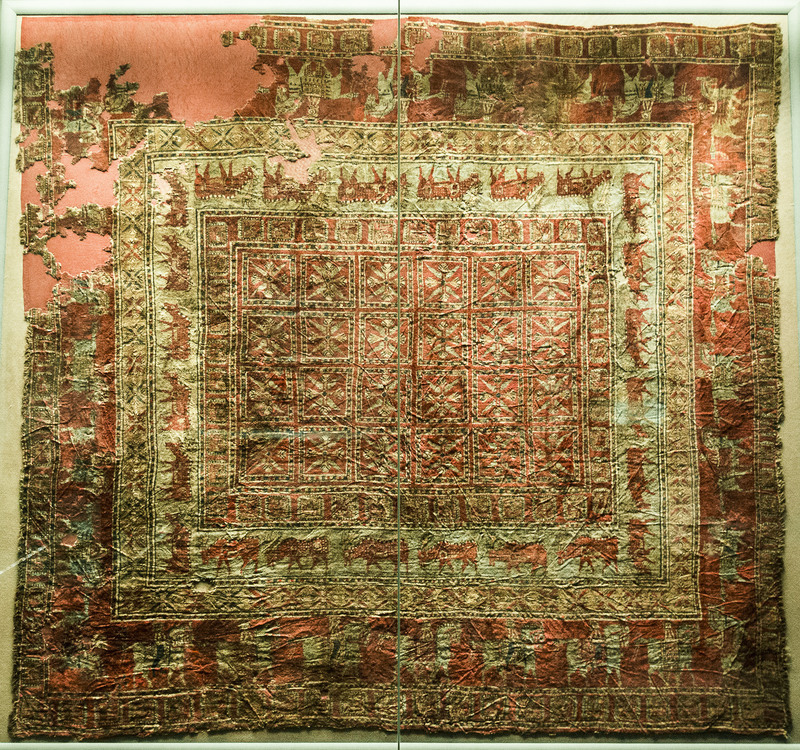 The picture below is of the Pazyryc Carpet, which was discovered in Siberia in 1947 and is now displayed at the Hermitage Museum in St. Petersburg. It is currently the oldest ever found. The carpet’s incredible state of preservation is due to the fact that it was preserved for 2 millennia within a block of ice. According to Carpet Encyclopedia , it measures 183×200 cm and has a knot density of approximately 360, 000 knots per square meter, a higher knot density than most carpets seen in stores today. The pattern includes a central ribbon motif, border a procession with deers and another border warriors on horses. This carpet was probably manufactured in Armenia or Persia around 400 BC. Head over to Carpet Encyclopedia for more info on this amazing work of art. It is believed that the carpet was developed by nomadic peoples living on the plains of Central Asia, as a more easily portable source of warmth than animal skins. Their looms, in their simplest form, were made of two wooden ribs which were secured to the ground and between them the warp was fastened. Similar looms , which fold easily for transportation, are still used today by the nomads, as pictured below. Red Cross poster circa 1918. Reproduced and available for purchase at The Library of Congress online shop. As during the War Between the States, knitting played an important role on the home front, providing those left behind with a purpose, and those fighting with a few comforts. The American Red Cross played a vital role in organizing knitting drives across the US. Below is a link to the socks pattern distributed to volunteer knitters by the Red Cross. This page features a clip of one of the newspapers in which the pattern was originally made available to the public. There are numerous other vintage patterns available on the net. Via the Art Fire site, where I maintain my shop, I came across a new article describing a dye method I’d never thought of using on clothing. The tutorial contains a pattern for a pretty triangular lace shawl, and directions for handpainting it, with several interesting design variations. It also specifies an unusual method to set the dyes; hint: it involves a car! I’m not posting any photos because of copyright restrictions, but trust me, the results are stunning. Check it out here. The shawl is named “Melusine”, because of its ability to take on different colorations. 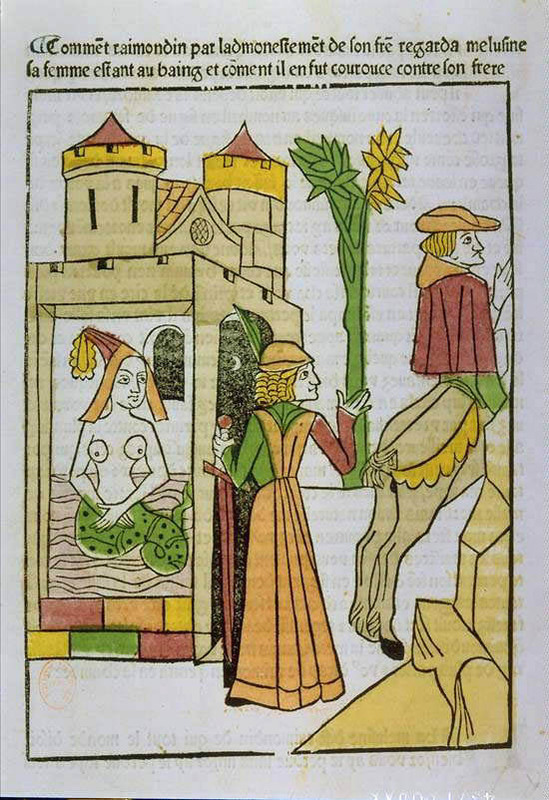 I’ve included the myth of Melusine for you to think about as you’re knitting. Melusine was the daughter of a fairy and a king. She grew up to become the fairy Queen of the forest of Colombiers in Poitou, France. One day, she and two of her subjects were guarding their sacred fountain when they were visited by a handsome young man, Raymond of Poitiers. He and Melusine talked all night, and she agreed to become his bride, on the condition that Raymond promise that he would never see her on a Saturday. He agreed, and they married. Melusine brought her husband great wealth and prosperity. She built the fortress of Lusignan, so quickly that it appeared to be made by magic. Over time, Melusine built many more castles, fortresses, churches, towers and towns, each in a single night. She and Raymond had ten children, but each of them was flawed, with mismatched or missing eyes or ears, a lion’s foot, or huge teeth. In spite of their strange deformities, the children were strong, talented and loved throughout the land. The family was very happy until Raymond’s brother paid them a visit and convinced him to be suspicious about his wife’s Saturday absences. The next Saturday, Raymond sought Melusine, and found her taking a bath. Spying on her, he was shocked to see that she had the body and tail of a serpent from her waist down, but he said nothing. One day, however, one of their sons attacked a monastery and killed one hundred monks, including one of his own brothers. Raymond angrily accused Melusine of contaminating his line with her serpent nature, and she knew that he had broken his betrothal promise.